When you get serious about trading, you realize two things fast. The first is that the markets are bursting with opportunities. The second is that spotting those opportunities takes a substantial investment of time, focus, skill, and dedication. If you are looking for a way to streamline your daily process planning trades and bring more consistency to your analysis, TrendSpider may be the way to make it happen. TrendSpider uses price action to help you identify trading opportunities. For that reason, it will be particularly appealing to you if you are already familiar with price pattern analysis. But even if that does not describe you, you should find that this tool produces excellent results, and makes price patterns more accessible to you. TrendSpider is an auto charting stock analysis software program which helps you to trade smarter. It is an application which takes the charting work that you would usually do manually, and does it for you according to its own algorithms. Unlike many signal services which you may have tried in the past, it does not simply generate a trade and fail to explain to you how that trade was generated. Instead, it plots the relevant trendlines directly on your charts, and marks the price patterns which signal possible trade entries. That means that you can review its analysis for yourself, pairing it with your own. You do not have to take anything on faith. You decide when to trade, and when to pass on a potential setup. Note this does not subtract risk from trading—nothing can eliminate risk fully. But it does maximize the amount of control you have over your trades while saving you time and adding more ease to facilitate the planning process. Before I press on further, I want to discuss price action briefly, in case you are new to it. With price action, instead of plotting a lot of indicators on your charts, you are looking at the formations of bars or candles. Certain patterns tend to precede certain movements in assets. Paired with trend lines or Fibonacci retracement levels for context, these patterns can signal you to take a trade. Overall, it is an elegant method for identifying trading opportunities. It removes a lot of clutter from your charts as well as the uncertainty and indecision that such clutter can lead to. It is relatively easy to grasp the basics of price action, even as a beginning trader. Price action can be used for trading stocks, currencies, commodities, and other assets. It translates well across a variety of time frames. As such, it is a versatile method. It has also produced excellent results over many years of use. When I got into learning price action, it was years before this type of software was available. As a result, I learned how to do everything manually with no programmed assistance. I discovered a couple of things. First, the simplicity and reliability of price action makes it (to me) an obvious choice as a trading method. Second, despite this, applying it accurately and achieving consistent results still takes a surprising amount of work and a solid understanding of context. But in order to be successful, it is critical to be able to identify superlative setups. This is exactly where TrendSpider can come to your aid. 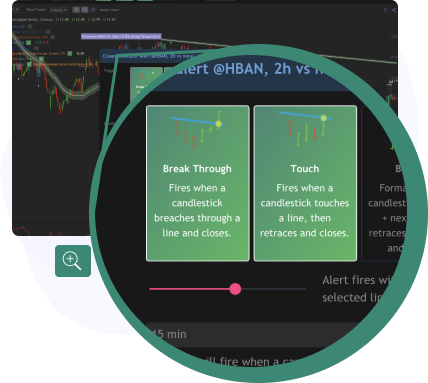 When you open TrendSpider, you can begin by setting up your charts with your preferences for colors, candlesticks, and so forth. Once you have your settings the way you like them, you can pick an asset, and TrendSpider will draw trend lines for you directly on the chart. There are customization settings you can use to determine what types of trend lines are displayed. You can pick the Original, Enhanced, or Experimental algorithm. You also can choose a “conviction” setting for the trend lines. If you want to see only the most solid trend lines, go with the “High” setting. If you want, you can customize the formulas used to generate the trend lines. Along with basic trend lines, TrendSpider also can draw Fibonacci retracement levels. If you have ever struggled (and doubtless you have) to identify swing highs and swing lows while drawing these levels manually, you were going to love this feature, which takes care of this for you. Once you have your trend lines and Fibonacci retracement levels in place, you do have the option of loading in other indicators if you want them. There are more than 40 to pick from. Another nice feature is Multi-Timeframe Analysis. Basically, the software will look at trend lines across a range of time frames and perform analysis to help you spot confluence between them. Everything I have just gone over regards providing context to frame trade setups. What about price patterns? The program lets you choose which candlestick patterns you want the program to look for and mark on your charts. There is a sizable selection, so you should be able to find most of what you like to use. Other useful features include watch lists and alerts. The alerts in particular are deeply customizable with dynamic settings and unique triggers available. This is a huge help in terms of reducing unnecessary alerts as well as making sure that you can pinpoint and seize key opportunities. The charts this program displays can be customized to your needs, and display beautifully and function smoothly. You can customize the way that the trend lines are drawn, and decide how high or low you want your risk exposure to be based on your comfort level. If you want to use indicators, there are more than 40 waiting for you. The program can identify numerous price patterns which you can use in your analysis. 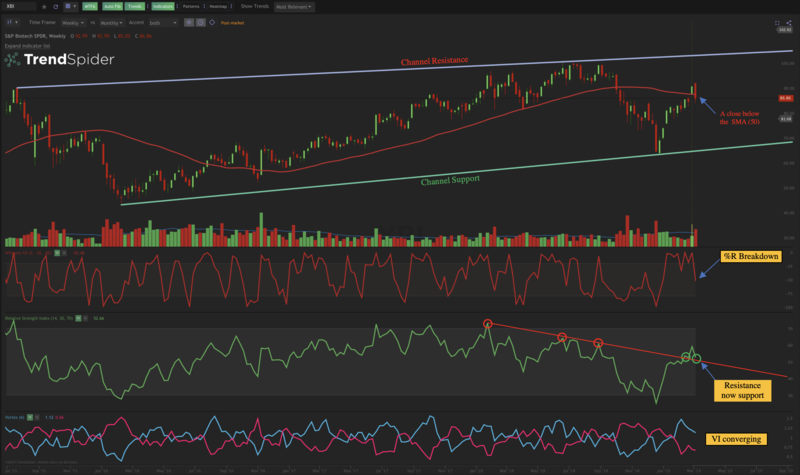 TrendSpider helps to identify those pesky swing highs and swing lows. Analyzing multiple time frames is easier than ever with the help of TrendSpider. Overall, the program is intuitive and streamlined, making it relatively easy to learn how to use even if you are a trading newbie. Even though automation is involved with this software, it features full transparency. You can look into—or even tweak—its formulas. You also can, of course, analyze the outputs against your own standards. The alert system is another standout feature. Not only does it keep your trading well within your control, but it also can help you to identify opportunities and monitor open trades while you are away from your screen. Even though other programs feature similar alert systems, this one offers unparalleled customization options, making alerts more personalized and effective. This program isn’t cheap. There are several different plans, depending on what types of assets you want. For just stocks & EFTs, the cost is $39 a month as of the time of this writing. The price is the same for just forex & crypto. You get a healthy discount for all assets, which costs $59 a month. If you put this program to good use, this should pay for itself each month (or at least over time, if you are a position trader). It could, however, be something of an entry barrier if you are a trader with a smaller account starting out. Who Should Use TrendSpider Stock Analysis Software For Their Trades? 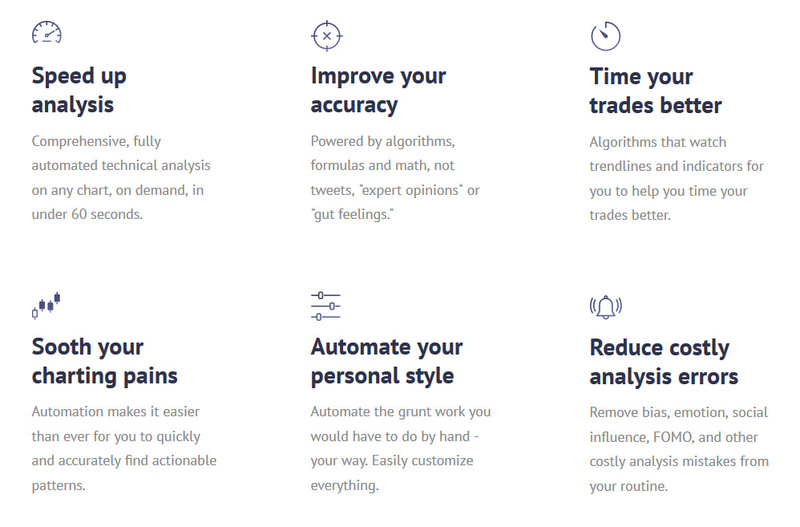 Is this trend trading software right for you? Below are my thoughts. As you will see, there are a lot of use cases I have identified. You have a price analysis system already, or plan to develop one. If you have no interest in trading price patterns and using trend lines, this product is not really suited to your purposes. You want to streamline and simplify your trading process. Using TrendSpider makes it faster and easier to do what you are doing already. You want to improve the overall consistency of your trading. As a human being, there are many factors which impact you on a daily basis which can disrupt your consistency. But consistency is key when trading. It is what allows you to produce reliable results in chaotic conditions. A program which runs specific algorithms is not subject to the same variables that you are, and may produce more consistent results. You need help spotting patterns. It is one thing to know what a price pattern is supposed to look like. It is another to be able to identify one while scanning through charts of data. All too often, we can overlook setups with strong potential, or over-inflate the significance of mediocre setups. With TrendSpider on your side, it is easier to recognize candlestick patterns that may pay off. You require aid in visualizing context and confluence. This is a huge benefit, as this is an area where a lot of traders have a hard time, even after they learn what an ideal pattern looks like. TrendSpider can make it easier to figure out whether a price pattern is occurring in a time and at a location on your chart which is conducive to a potential win. You are in search of a learning tool to help you improve your manual skills. 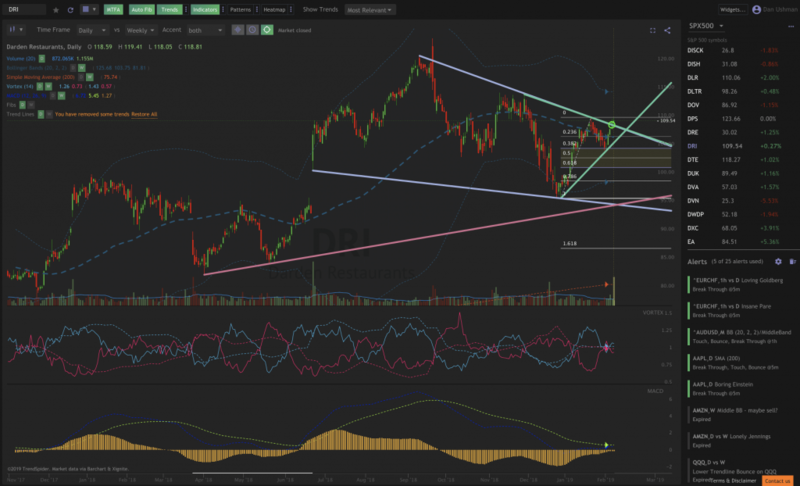 Even if you ultimately are interested in doing all of the legwork yourself with price action trading, I might still recommend giving TrendSpider a try. As a learning aid, it can provide you with examples of well-drawn trend lines and ideally-formed price patterns. You want to take your existing price action system to the next level. With the trend lines and price patterns this program identifies, you may spot some missed opportunities for adjusting your strategies. You need totroubleshoot problems with an underperforming price action system. Using this software may help you identify where you are going wrong. You want to save time planning your trades. In general, if you are pressed for time, TrendSpider could restore minutes or even hours to your days. For this reason, it might also be a great tool to use if you want to trade on faster time frames where speed is of the essence in identifying and acting on a potential trade setup. You want a more powerful system for customizing your alerts. If you are not satisfied with the alert system you are currently using, you may find that the system included with TrendSpider can deliver the customization features you need. You are looking for a fully automated trading robot that does all of the work for you, including planning your trades and executing them. TrendSpider is appropriate for beginning, intermediate, and advanced traders. It is very important to understand that you must have a trading method in order to get any real value out of this program. Why? Because without rules for entries, exits, trend lines, patterns, and so on, you will be trading inconsistently, even with TrendSpider’s help. This will lead to more unpredictable results. If you already have such a system which you have been using manually, it should be fairly easy to start using TrendSpider to help you trade that system more effectively. If you do not have a trading system already, you can experiment with TrendSpider’s tools and work on developing one. Where Can You Get TrendSpider? Ready to trade smarter, faster and more consistently with the help of TrendSpider? With this auto charting software program on your side, you can potentially revolutionize your trading process overnight, getting more out of your manual system. Even better, we have a limited time Trendspider free trial offer for new users. Click below to get it now!